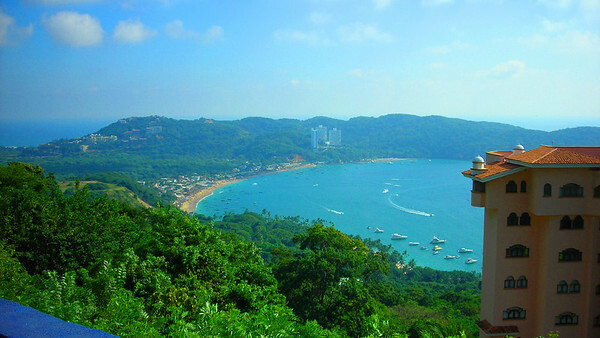 We tool into Ixtapa and ride up and down the hotel zone. It became obvious right away that this is all way out of our price range, all inclusive resorts in huge compounds and all on the beach. -> Plan B. 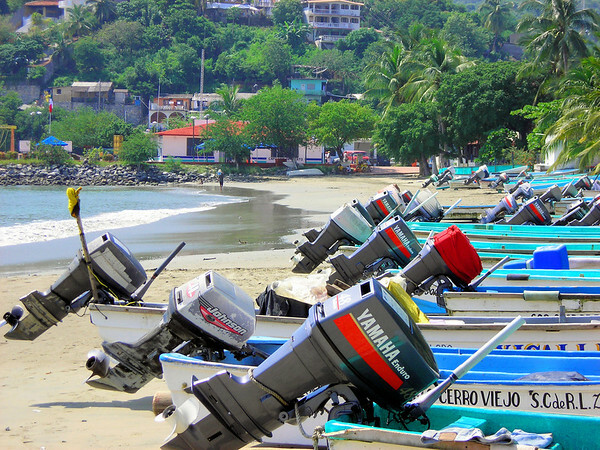 A twin city to Ixtapa is Zihuatanejo, an older and more Mexican tourist town. 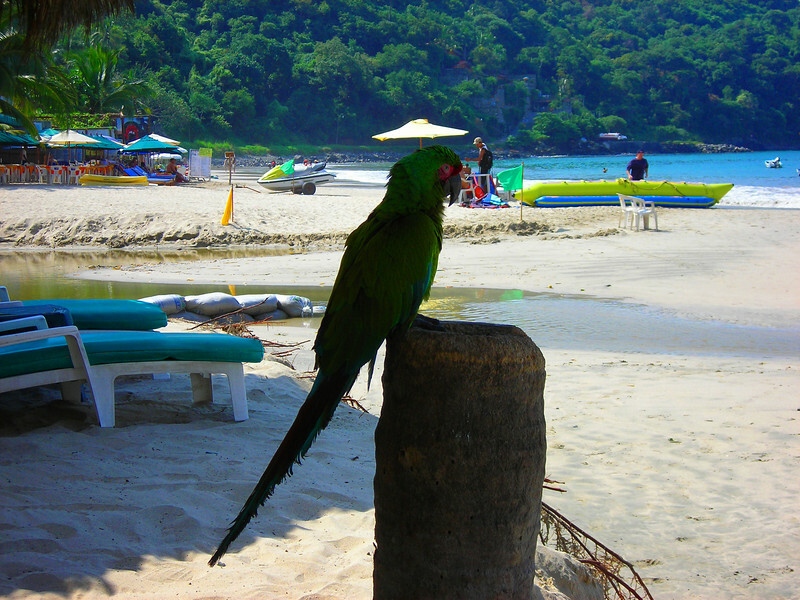 We’ve heard good things about Zihuatanejo from an owner of a hotel we met in Todos Santos. Riding into Zihuatanejo we soon found ourselves lost on some narrow and steep stone studded residential street. The road was going nowhere, we turn around. 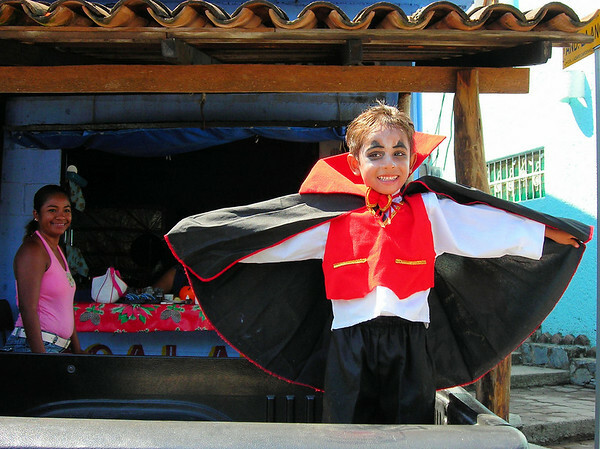 This was Halloween day and we see this kid standing in the back of a pickup truck. What a great photo! Sometimes it pays off to get lost. 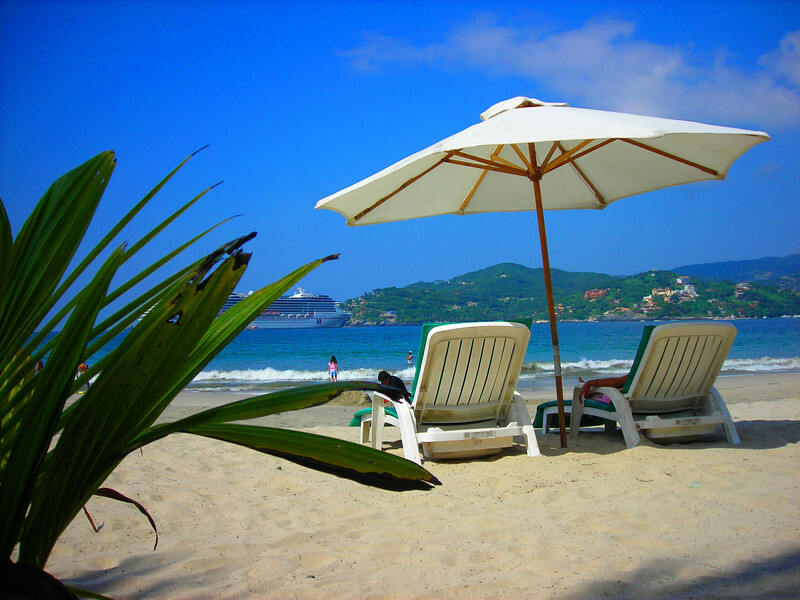 We cruise straight through Zihuatanejo centrol zone and to the beach area on the south side. We get all the way to the end of the beach where I stop the bike and have a talk with Heidi. A nice guy walks up to us and tells about the hotels close by and the prices, how great is that. We pull into the second hotel from the end because it looked like it had the best parking. I roll in and look closer at the parking. The owner, Fidel greets us right away and shows us a room. I say “?Tiene habitacion cerca de estacionamiento para de moto? (Do you have a room close to where I can park the motorcycle?) He shows us the first room and says I can park the bike practically right next to the window. While I’m moving the bike Fidel shows Heidi a photo on his camera phone of his Honda Gold Wing with a nice flame paint job. While registering for the room Fidel explains to me about a moto fiesta (motorcycle rally) he goes to that’s about 600 km from here. He says it goes on for about a week and he has a good time there. Wow, what a score. The room is right on the beach and Fidel treats us like VIP’s. If anyplace can be called a paradise this is it. The price was close to our high end, $45 / night, but we just had to sigh up for three nights. We could have stayed here for months. 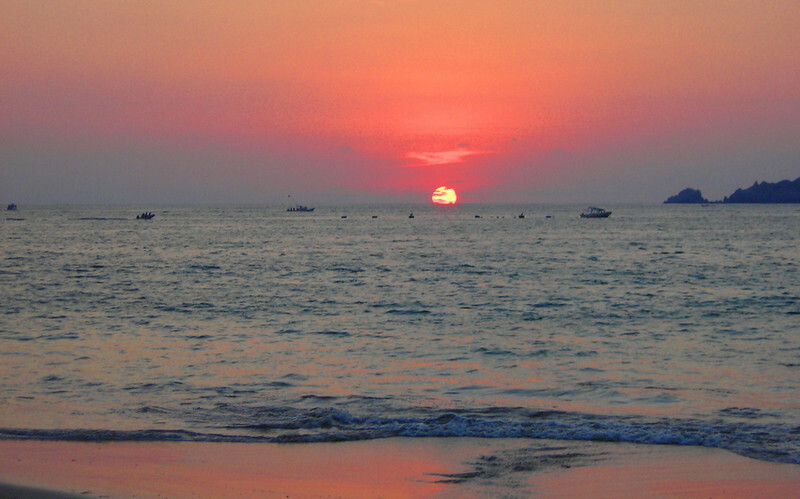 Check it out, Hotel Casa del Mar. 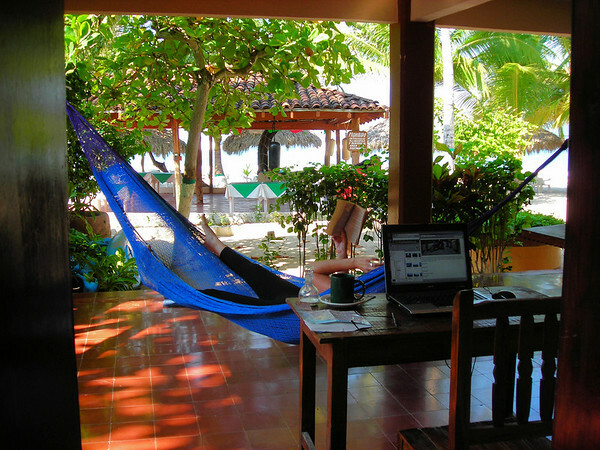 Recommended……www-zihua-casadelmar.com Hotel Ecologico. 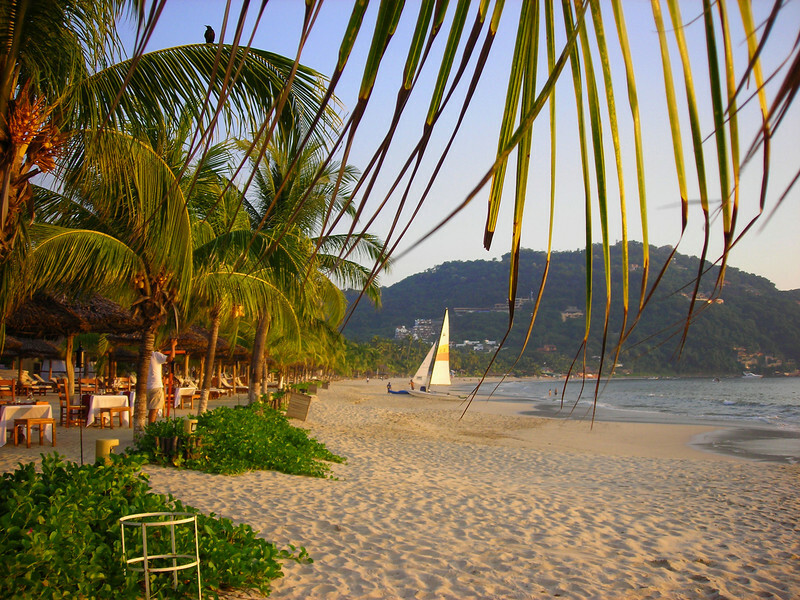 The hotel has a great restaurant with service on the beach or at your room and the food is fantastic. There is a stream that runs right through the hotel. Some local crocodiles hang out here. 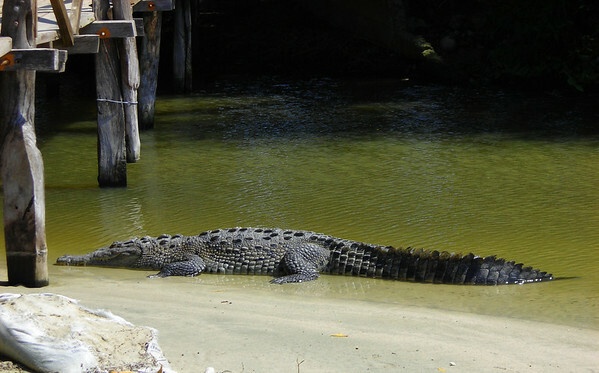 The hotel restaurant is called cocodrilos, this is why! A big bluff has to be climbed before heading into town and to beach centro. 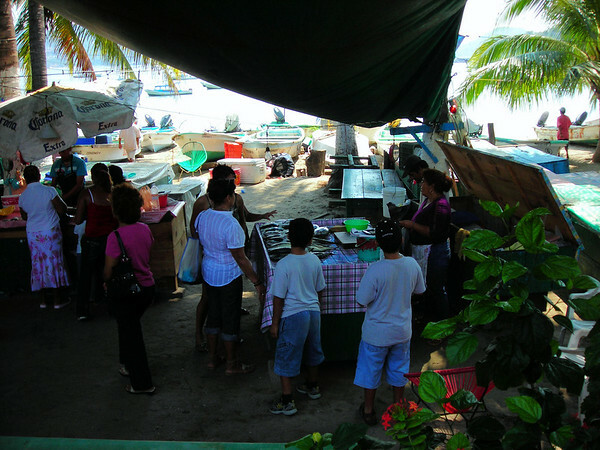 Dozens of tables selling the catch of the day. 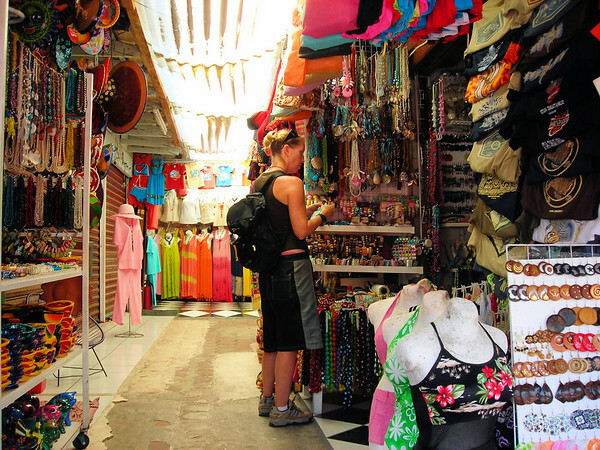 Zihuatanejo centrol zone has endless shops and tons of stuff to buy. 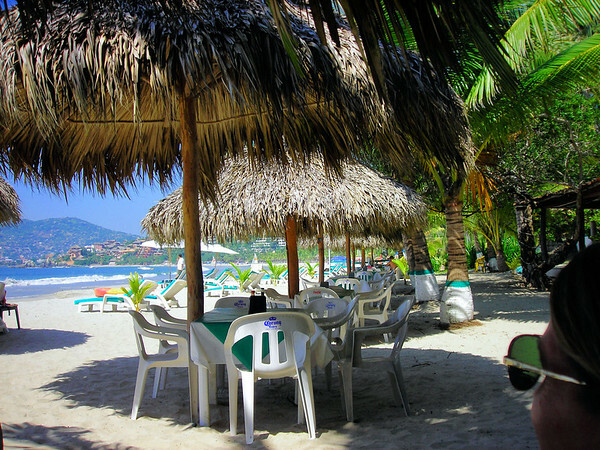 A lot of good places to eat also…..
Back at the hotel we kick back in a beach chair and enjoy the scene. 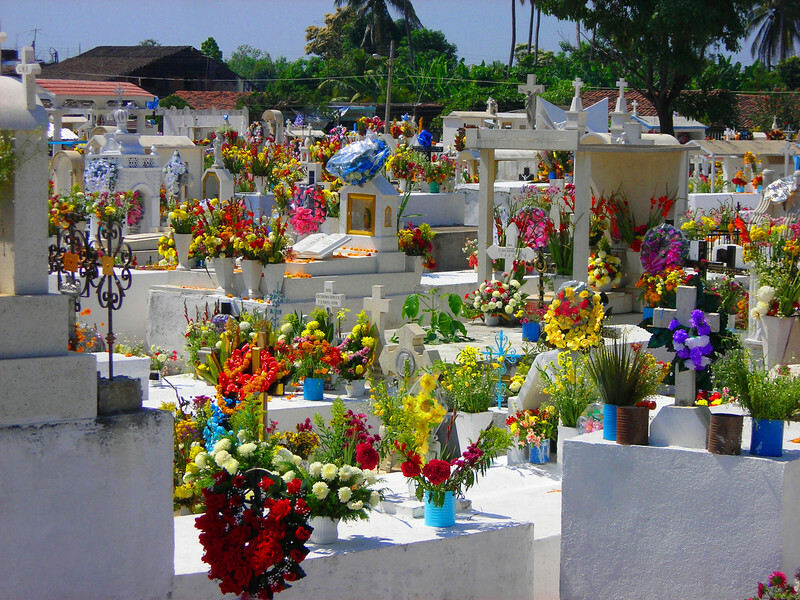 Day of the Dead - November 2 nd. This is a big day in Mexico. The idea is to remember your dead loved ones and spend some time with them. 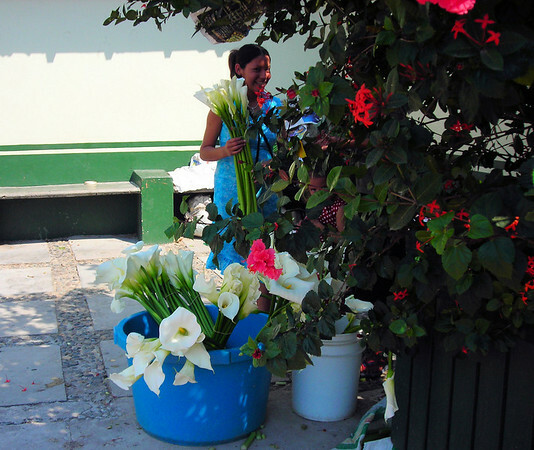 A lot of people were buying candles and flowers for decorating the cemetery. Families go to and hang out in the cemetery at night with food to eat and offer to the dead. You see skeletons with smiling faces along with skulls made of chocolate or sugar for sale everywhere. 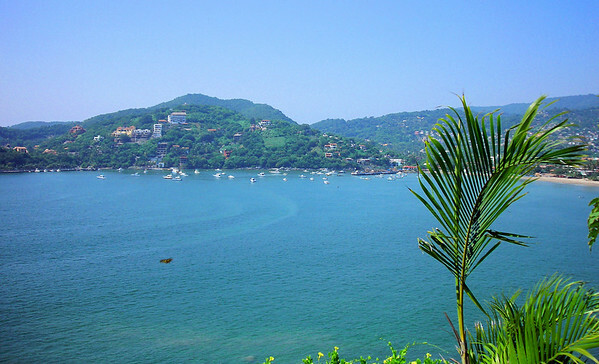 Next we shoot for Acapulco, just a short ride south along the Pacific coast. The roads start out twisty with high dense foliage right up to and sometimes sticking out onto the roadway. About 50 miles later the road straightens out at times with more open fields, a few tractors, pigs and burros on the road. 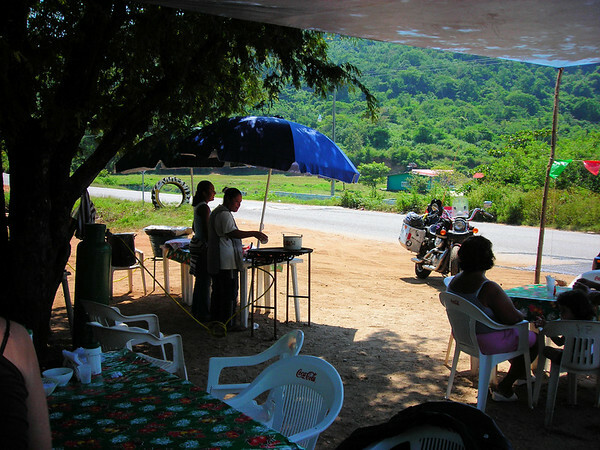 In route I see a small taco stand along the road that looked friendly and decide to stop for a bite. Heidi and I try so hard to speak proper Spanish but at times I really fumble it up. For some reason we always are treated so well at places like this. Here we had four or five people all taking turns waiting on us and trying to communicate, a few words of English here and there but mostly Spanish. Heidi is getting much more comfortable speaking Spanish and is, I think, really good at it. Anyway, the owner, Jose, is super friendly and proceeds to tell all about what it is like to live and work in Mexico and in the USA. Jose skipped across the border to the USA several years ago and worked in Chicago for three and a half years. He explains with emotion what it was like to be stopped by the police in Chicago and how well they treated him. 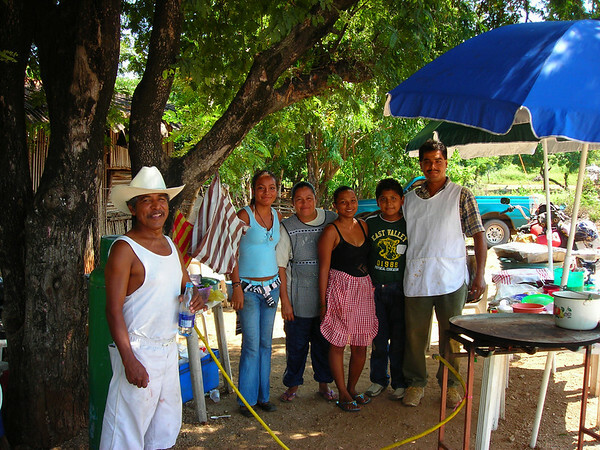 Jose came back to Mexico with a nice pickup truck and enough money to start this small business, employing his son and four of his friends. Jose explains how in Mexico you can earn enough money to eat a few tacos a day, cloth yourself but nothing more. 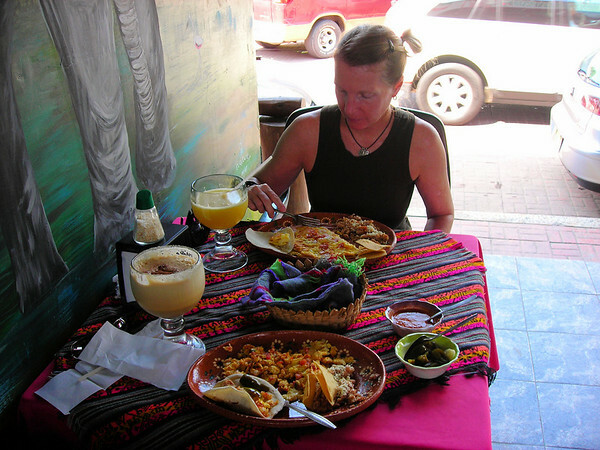 This is a big part of why we like traveling in Mexico and stopping at places off the beaten path. What a group of beautiful and kindhearted people. We feel very blessed to have met them. 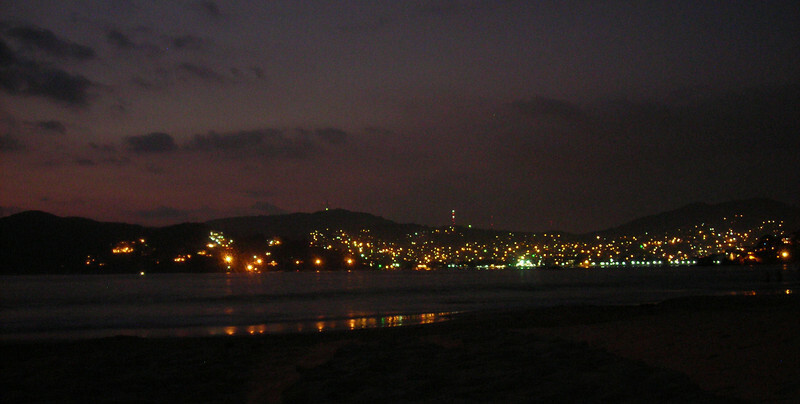 To say Acapulco is like Mazatlan on steroids would be an understatement. 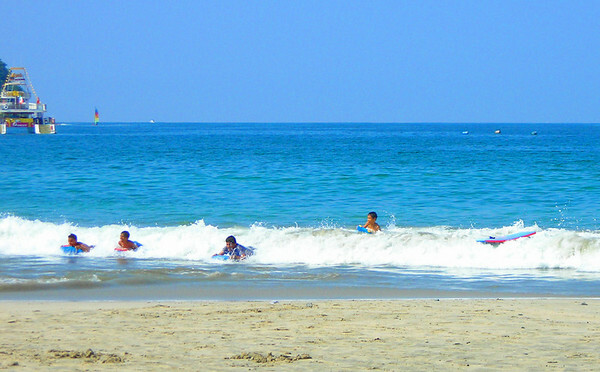 There was what seemed like billions of people everywhere, on the streets, bobbing in the water and on the roads. This is not our kind of scene. 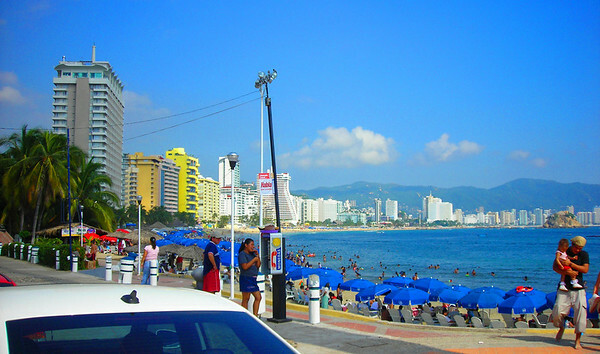 We look at a map and see a stretch of highway south of Acapulco running along the coast. We think that there will be more low key hotels there. We ride through town and are just glad to make it out of there alive and in one piece. Well, the stretch of highway where we were hoping to find a hotel had nothing. We continue south hoping to find something in a city further on. This is rural Mexico here, pigs, chickens, farm fields and coconut fields. It’s getting late and we are both starting to get a little concerned. It’s dark by 6:30 PM now and We Will Not drive in the dark. I am fully prepared to ask a farmer along the road if they can put us up for the night. I’m practicing Spanish phrases in my head to ask for help. I did this my first motorcycle trip into Mexico back in 02’ and it was a wonderful experience. I have full confidence we will be helped out if we need it. Finally around 5:30 PM, 30 minutes before I start begging for help, we pull into a small town, San Marcos. This is a cross road town for two highways and it had several hotels. Yes, we are set. We ride back and forth through town and pick a hotel that looked the friendliest for motorcycle parking. We pull in and see a couple of adventure motorcycles. Heidi says “These are the same bikes we saw at that hotel in Tecoman” We both recognized the weird looking plates.